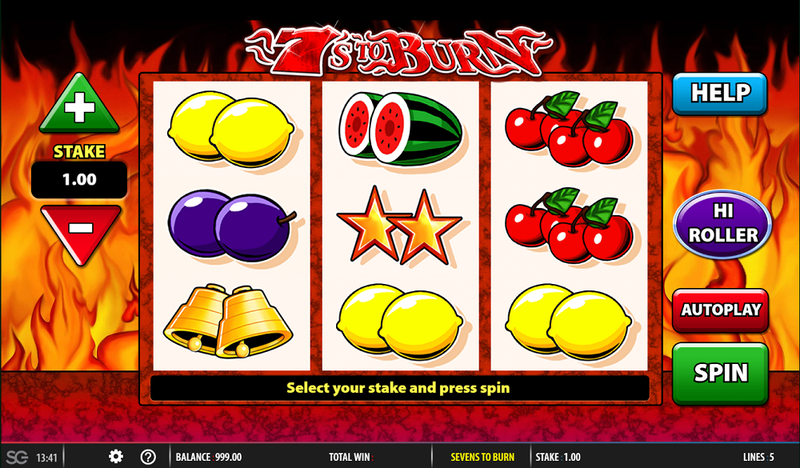 If you are a fan of the classic fruit machine slot, then you are going to love 7’s To Burn. This exciting slot is from Barcrest and is available to play on Rocket Bingo! This fiery game looks just like a regular fruit machine with only three reels and some of the classic symbols. Of course, there is also a lot of flames in the background which help to show off the burning theme. The graphics are quite simple, but it works for the type of slot that this is. In terms of symbols, you’ll find all of your favourite fruit machine symbols on there including the bells, the lucky sevens and the watermelons. The lowest paying symbols are the cherries and the other fruit which you can still spin to win big on! Also, on the reels are some fiery sevens which act as the wild symbol for this game and are the most valuable on the reels. Look out for these as you spin to win! 7’s To Burn is a fun game which is easy to play. First, you’ll need to decide how much you are going to bet on each spin. You can easily do this at the left of the reels where there are + and – buttons. You’ll be betting on the 5 paylines so consider your total stake. Once you are ready to spin, press the green button and watch as new symbols appear. To win on 7’s To Burn, you’ll need to land at least three matching symbols on a payline. When you do, your prize will be added to your prize fund so get spinning right away! Barcrest have added some exciting features to this game while keeping it quite simple for new players or those who enjoy the classic fruit machine slot. One of the features is the wild symbol which comes in the form of the burning sevens. However, you should know that this symbol isn’t like the traditional wild symbol as it only substitutes for the red sevens to give you a winning combination! Of course, in the next feature, you will see the wild symbol come into action a little more. The other exciting feature in 7’s To Burn is the High Roller Spins feature. This is a great feature which will let you win even more cash if you are feeling brave. To use this feature, you’ll simply press the High Roller button and buy yourself 5 extra spins. This will cost you a little more, but it will be worth it if you win big. Watch as the burning sevens on the reels become wild for all of the symbols instead of just the red sevens. Make sure to check the rules as payouts will be halved during this round! 7’s To Burn is a simple game which traditional slot fans are sure to love. The simple design works well but it also comes with a fiery twist that makes it a little more interesting. Don’t miss out on winning big on this slot – get spinning on 7’s To Burn today to see what sort of cash you can win!